Located just a 2-minute walk from Gaudi’s iconic Sagrada Familia basilica, Bcn Condal Apartments is located in Barcelona’s Eixample district. It offers free Wi-Fi, free coffee and hot drinks, and is 300 metres from Sagrada Familia Metro Station. 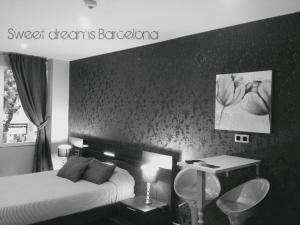 Bcn Condal Apartments offers simple and comfortable accommodation. Each room has central heating, and is equipped with a TV, wardrobe and desk. The rooms all have a shower and sink and some have a private bathroom. The property offers free luggage storage, as well as free tourist information, maps and discounts. The guest house is situated in a quiet area, ideal if you want to be out of the city centre, but have the city’s famous landmarks within easy reach. The spectacular Hospital Sant Pau is just an 5-minute walk away, while the city centre can be reached by metro in 5 minutes from Sagrada Familia station. Please note that Bcn Condal Apartments reserves the right to apply charges to guests for any damages to the property or any of its facilities. This room has 1 double bed or 2 single beds and sheets and towels are provided. The room is bright and has a TV and a desk. It has its own shower and sink, while WC facilities are shared and are located down the hallway. Rate: € 68.85 ... € 2781.00; select dates below to get current rates. This modern room features a flat-screen TV, a safe and a wardrobe. Rooms are 13 square metres. Rate: € 64.80 ... € 1366.56; select dates below to get current rates.